viii, 64 leaves : ; 29 cm. Thesis (Ph.D.)--University of Florida, 2003. This dissertation is dedicated to my husband, Peter Thompson. thanks go to my parents for their pride in my professional and personal accomplishments. redistribution at both the local and national levels. Representatives, responding to changes in the demographic makeup of their districts. have no significant effect on education spending. The government provides goods and services for many different groups in society. mix of services provided by the public sector. (Baker and Weisbrot 1999 and Schultz 1995). contribution rate as well as educational expansion. may be because local education expenditures are capitalized into housing prices. elderly will be small; thus, the elderly should be unwilling to fund education. not explain why we might be more altruistic toward some people than others. others. That is, if the elderly subscribe to the idea that "it takes a village to raise a child,"
a geographic sense or with whom they identify in some other way. moved in from far away. do they vote according to their own preferences? from the individual inclinations of the various members of Congress. children, legislators are more likely to vote to support redistribution toward children. affect support for redistribution to the competing cohort. appropriate level of aggregation to investigate changes in Congressional voting behavior. and decreased well-being of children from 1960 to 1980.
this might have on voting behavior. time for which Stratmann does not control. preferences for specific types of issues, such as those affecting the elderly. of the district, a greater ideological shift in Representatives' voting records resulted. two-party vote for Dukakis in the district before and after redistricting. for which I must adjust. legislator before and after the most recent redistricting. Persons (AARP) begins at 50.
programs for children, such as welfare, begin at birth. 2 Special thanks are due to Alex Hooper for his most able assistance in constructing the Census dataset. proportion of women and fraction of the constituency with a college degree. more than one standard deviation from the mean change for 64 of the 322 legislators. 2-2 to illustrate how some Representatives' constituencies changed. legislator's vote on each bill is recorded in the Congressional Quarterly Almanac (CQA). Sometimes it was even difficult to determine whether a vote was pro-elderly. been perfect additions to the index. The final list of votes included is in the Appendix. and for the periods before and after the 1992 redistricting. separate from the other issues included in the bills. of the model is much lower, with an adjusted R-squared statistic of 0.4110.
and educational attainment (fraction with college degree). corrected for heteroskedasticity and clustering of errors within Congressional districts. The sample is made up of 276 legislators for two periods, before and after redistricting. reflected by a Representative with a higher index value. interaction between proportion elderly and income. government support for the elderly simply because they live longer than men. are found using the means of the interacted variables. children and college graduates have no statistically significant effect. be less likely to prefer government services for seniors. in only 30 of the 552 observations. that per capital income captures most of the effects of permanent income. chronological edges of the dataset. subsidized housing, which are antipoverty measures. the elderly to increase if a larger fraction of his constituency is aged 55 and older. related bills to analyze legislators' voting behavior on issues of direct foreign investment. the interaction coefficient should be negative. expect the income coefficient to be negative, as the wealthy prefer less redistribution. women should have a positive effect. 164 Representatives who voted on this pair of bills. Retirement," was to determine the appropriate age for mandatory pilot retirement. voted on this pair of bills. number is the effect of moving from a vote of 0 to a vote of 1.
vote pro-elderly on the bill..
college degree have little effect. probability the Representative will vote to limit age discrimination in this bill by 0.13.
deviation increase in the fraction aged 65 and older is to reduce the probability by 0.11.
above the typical working age --- are less concerned with these issues. children does not negatively impact votes on elderly issues. education is related to permanent income, the education coefficient should be negative. Representatives voting on this pair of bills. older coefficient should be negative. The fraction children coefficient should be positive. for the pairs of bills relating to children's issues. redistricting vote. As expected, the earlier vote's coefficient is positive, and very large. a pro-child stance on the earlier vote. to the well-being of children. indeed Representatives when voting on issues related to the elderly. It should be noted that this analysis does not take several factors into account. well as issues of intergenerational conflict. unique instruments to explicitly explain the migration behavior of the elderly. elderly has no significant effect on per child education spending in any specification. when they make decisions about funding for education. the elderly will be small; thus, the elderly should be unwilling to fund education. geographic sense or with whom they identify in some other way. explain school spending. Finally, some concluding remarks are presented. In this paper I explore the effect of elderly migration on education expenditures. from within the same state; and the fraction that migrated from a different state. inmigrants from out of state. data source to avoid measurement error. variables in X are from the 1990 Census of Population and Housing. Community-based altruism should be higher where the communities are smaller. as the number of districts increases. because the elderly may feel more altruism toward children who are more like them. logarithm, and the resultant decrease in sample size. heterogeneity. Previous researchers use a simple difference, but the linear distance is the absolute value. education subsidy from wealthier families shrinks. shown later change appreciably when the alternate measure is used. 2 Denzau and Grier (1984). by the higher wages paid in urban areas. enrolled in the fall semester, to yield the dependent variable and federal aid per pupil. consists of 2,520 counties from the remaining 36 continental states. education. Finally, the error term ij is assumed to have zero mean and constant variance. area. Table 3-1 shows the key summary statistics for the 2 county-level samples. Variable Mean Std. dev. Min. Max. of the 1850 observations in the full sample for which the fraction rural is less than 1.
within a state, and an additional .06% are elderly from out of state. deviation change in the explanatory variable. All variables are in natural logarithms. All specifications include state dummies. rural is less than 1.
dollar effect of -$95 is indeed more negative than the estimate for instate movers. elderly than nonwhite children; for these counties, the difference in definition matters. simple difference does lead to a slightly better fit, as measured by the adjusted R squared. are $384 in the full sample and $466 in the urban subsample. are -$64 and -$95, respectively. estimated dollar effects of $76 to $110.
" See Denzau and Grier (1984) for consistent estimates of key parameters affecting education spending. fairly large, at -0.15 to -0.27, but the estimated dollar effects are only -$85 to -$95. migration patterns of the elderly. 5 See, again, Denzau and Grier. should have a positive effect on elderly inmigration. these variables to be positive, as beaches are best enjoyed in warm weather. be undesirable to the elderly. population living in an urban area is from the 1990 Census of population. 17 See Fournier, Rasmussen and Serow (1988).
" Special thanks to David Figlio and Joe Stone for the land slope data. counties where there are no weather stations in the adjacent counties) were averaged. temperature is 38 to 400 Fahrenheit, and ranges from 1 to 730 Fahrenheit. standard deviation of over one, and a range of 0.01 to 6.9.
move out of state, and becomes even more important in coastal areas. for which the fraction rural is less than 1.
effect is larger: an increase of 0.0010 in the full sample and 0.0006 in the urban sample. regressions, and from 0.0009 to 0.0014 in the three-stage regressions. where it is estimated to increase migration by 0.0010 in both the full and urban samples. urban sample. Only 520 counties of 2,520 have mean January temperatures below 28.5. $4,500) by $158 to $232. significant, so the ordering is partially correct. 9 Using the predicted standard deviations from the first stage regressions. to $412 increase in per pupil revenues. significant in all specifications, with estimated elasticities ranging from 0.35 to 0.46.
the urban sample in both specifications. negative and significant in all regressions, as we would expect of an own price elasticity. The price elasticities, which range from -0.11 to -0.26, are close to the OLS estimates. 0.05 to 0.11 and estimated dollar effects of $111 to $149. that economy of scale effects and higher rural transportation costs dominate. tax price of education and the fraction of the population living in an urban area. offset this potential source of discord. surpluses to be held in trust for Soc. a special account until Soc. Sec. Andreoni, J, Cooperation in Public-Goods Experiments: Kindness or Confusion? 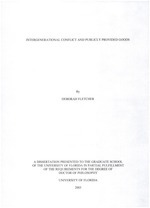 the University of Florida in August of 2003.
dissertation for the degree of Doctor of Philosophy. dissertation for the degree of Doctor of Philoso y.
dissertation for the degree of Doctor of Philoso hy. partial fulfillment of the requirements for the degree of Doctor of Philosophy.